Do these two paintings look like they were done by the same artist? Did you ever hear the story about the artist during WW2 who did paintings trying to forge Vermeer because Vermeer had recently been “rediscovered” and was suddenly popular? The forger had a respected art dealer who was in on the con game and convinced his wealthy art patrons he found early Vermeer paintings in an attic. The rich people wanted to own a Vermeer so badly they believed what they were told without question. The forger made a nice living during the war when most of the public was suffering. If my memory is correct, even Hitler fell for the scam. When I looked up Vermeer, I saw tons of photos of the one I saw in DC, “Girl With a Flute”. I think it’s a fake because it’s so far below Vermeer’s standards. 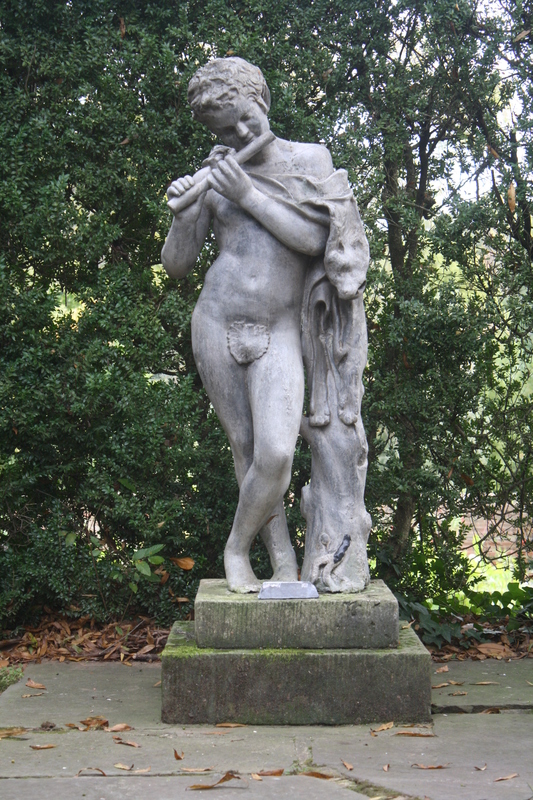 It seems there’s a lot of debate about the authenticity of “Girl With a Flute”. 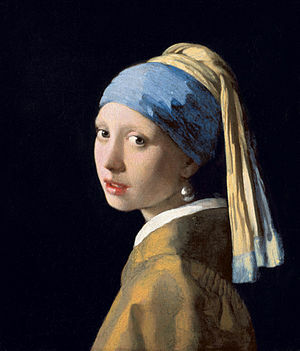 But I also saw an article saying that painting is a real Vermeer. It was one of his “early works”. 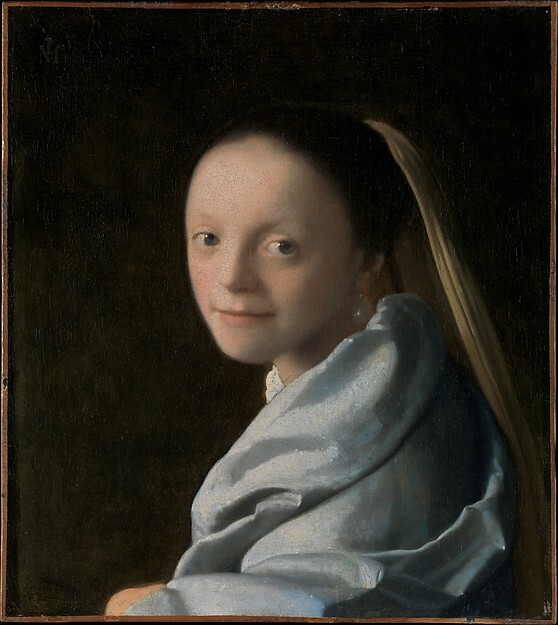 One of the reasons I think “Girl With a Flute” and this painting “Study of a Young Woman” are both fakes is this, if Vermeer only left the world, what, 30 some paintings? Why would he keep a bad one? It doesn’t make sense to me, so I think it’s not true. Do these two paintings look like they were painted by the same artist? As an artist myself, with little hope of ever finding fame and fortune, I can tell you, when I look back on my old paintings and drawings, I throw out the ones that make me say, “Oh No! I can do better!” When I die I don’t want to leave my daughter hundreds of paintings that show my progress. I’m going to only keep the best ones for her. And when I’m dead 500 years and “rediscovered” if there are any forgeries coming out, no one will get away with saying it was one of my early works. I think other artists might feel the same way, including Vermeer. I say ALL the weak Vermeers are FORGERIES! Do you ever get that feeling a statue is watching you? When I was working on that last painting, every time I turned around there’s this kid in ideal proportions right behind me! And he’s NEKKID! except for a seashell covering the naughty parts, and an animal hide over his shoulders. Sometimes, as I unloaded my art supplies around the base, I thought he might hit me with his flute! I know it’s only my imagination, but others said the same thing about it. My palette knife is in my hand as much time as my paintbrush. When I get to my location, it always takes me 1/2 hour or 45 min, to mix up my colors for the day. I decide what area to work on, then mix light medium and dark values of the colors I want to use. By mixing my colors on my palette with my palette knife, I get them closer to what you see with the naked eye, and avoid the problem of the colors mixing too much on the canvas and coming out muddy. But one thing I really enjoy a lot, is making thin lines with my palette knife. It’s easier to scratch a skinny line than it is to paint one. If you can get a clear enlargement of this photo on your computer, maybe you can see where I scratched all around this painting to make lines and give it texture. The way I did the brick wall, for example, was to paint the colors of the mortar first. I painted the wall with two shades of gray in the places I wanted there to be light and shadow. So, the whole wall was gray. Then, when that dried, I blobbed in brick colors on top of the gray and scratched through the wet layer to show the gray mortar color coming though as lines. You get bricks without painting every brick. But people see the detail, and might imagine I painted every brick. It works if you paint in the couch with Maroger Medium and glazes. I also like to scratch through my brushstrokes to feather the edges, and add texture. For the trees behind the house, I blobbed in three shades of green and scratched through the wet paint so the edges of my brush strokes wouldn’t be sharp, but a little blended. Visually, that helps the background trees recede a little. The trees in front of the house got scratched on the trunks but not the foliage. It took a long time to finish, and I could still keep on working on it, but I’m not going to. It looks like I painted a lot of detail, but I left out the detail I didn’t want to paint, gutters and downspouts, a planter with nothing blooming, and whatever else you might notice is missing, if you have a photo to compare it to. 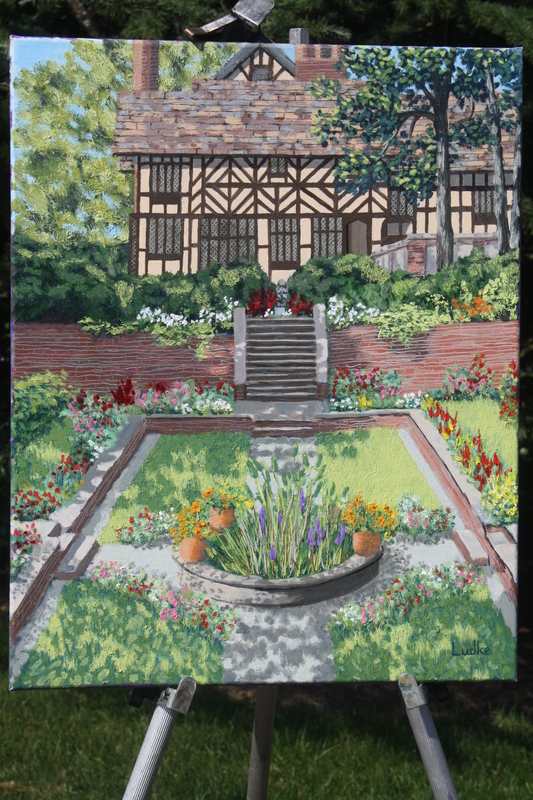 It seems like I worked on this painting at home as much as I worked on it at Agecroft. A lot of times, I can mix up some colors there, and paint at home on the more time consuming parts of the painting. 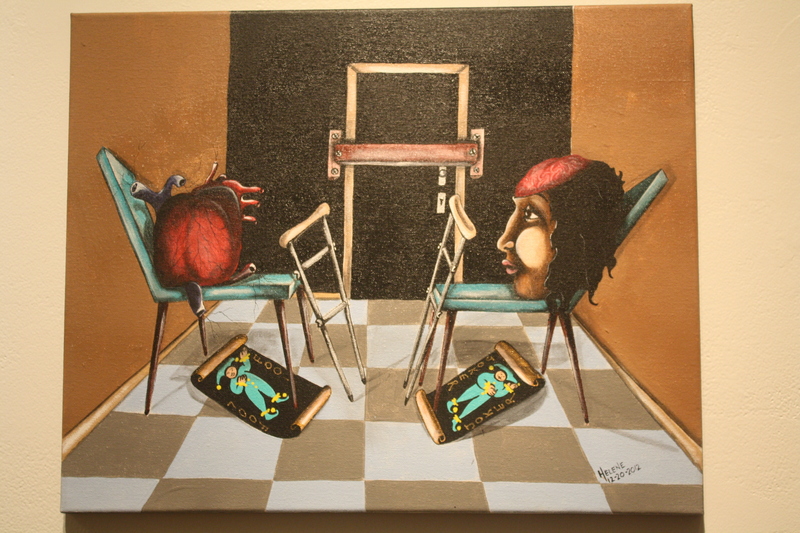 This is my favorite one of Helene’s paintings from her “Skulduggeries” series. Helene illustrates life’s hardships and the strange people you meet, with humor in her paintings. The show I entered with her group, the Urban Individualists, was titled “Entangled”. 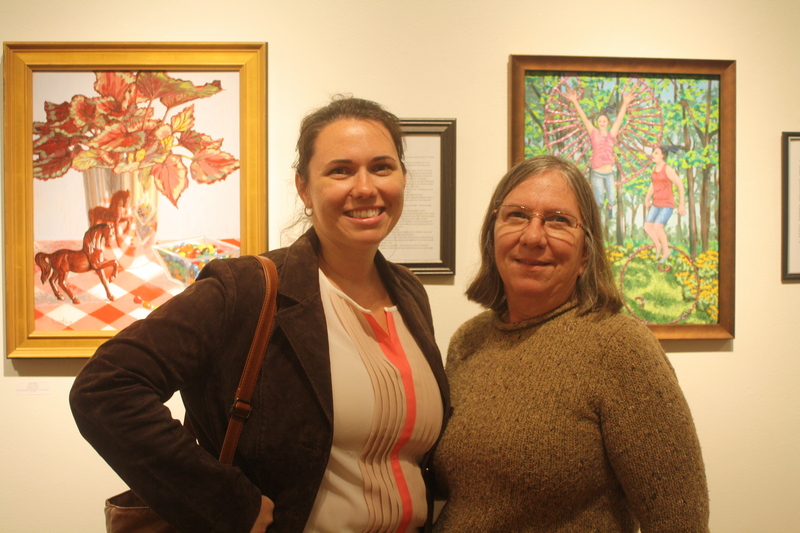 It’s a collaborative effort between visual artists and poets. The authors wrote a poem for a painting, and a painter illustrated a poem. The paintings and poems are hung together. And Helene had a section of the gallery for her Skullduggery paintings. The show is GREAT!! in my humble opinion. If you’re in the area and didn’t get there last night, you should go check it out. We also enjoyed the poetry readings and the Latin music ! I’m excited because this collage I did a few years ago got a lot of attention yesterday at the art opening of the James River Art League, at the Montpelier Art Center! 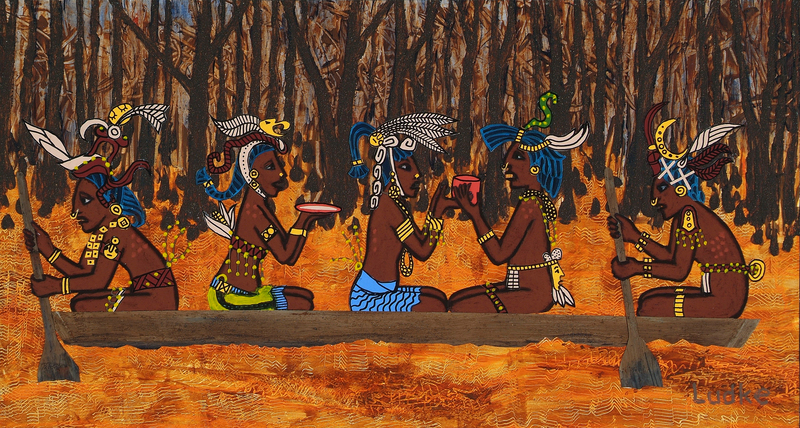 It was inspired by the Maya legend and I tried to copy their style of illustration. I have a good book about the Maya titled “The Maya” by Michael D. Coe. One thing I remember from this book is that it wasn’t too difficult for the Spanish who invaded Central America to convert the Maya to Christianity because there are similarities between the two religions, a resurrection being one important story. This is how the story goes, if I remember correctly. The Corn God was in the Underworld. That’s him, with the green sprout coming out of his head, in my collage. The two guys paddling the canoe are gods who were sent to rescue him. It’s a dangerous trip, and they could all get killed in some violent bloody way. If the Corn God doesn’t make it back to the Maya city, the crop will fail and the people will starve. The two girls in the canoe are virgins sent to wait on the Corn God. They’re offering him food and water. Later, at their ceremony, the virgins will be sacrificed and the Corn God will be drenched in their blood. Yes, they really did sacrifice virgins. They were a bloody tough tribe that didn’t fear pain or death. The Maya, never boring, always an inspiration. This is my illustration for a book my daughter, Sarah Hill wrote. An excerpt is posted below. Diana looked up at her and grinned, relief flashing in her face. She clearly wasn’t up for more talking either. “You sure that’s where you want to start? It’s kinda scary…” Diana trailed off for a moment. “But a lot of fun.” Kayce grinned back. “Yea let’s start there. I mean once I master flying, I’m pretty sure I can handle anything, right?” Kayce asked nervously. Diana raised her eyebrows, but the smile stayed on her face. The teenager and the woman stood up and walked out of the room, Diana’s arm over Kayce’s shoulder. “Well it’s not quite that easy, kiddo.” She said, leading the way to the back yard. “But this is definitely the fun part.” Kayce’s heart raced, both thrilled and surprised her mother was so willing to let her attempt such a dangerous lesson right out of the gate. “Don’t be scared,” Diana said, reading Kayce’s mind. “On Falconera they dropped us off of cliffs when we turned 15.” Kayce’s jaw dropped and her mother grinned and winked. Together the two of them entered the secluded yard, which backed up to the woods and fanned out in a wide, pie-piece-shaped property that hid the other neighbor’s houses on the cul-de-sac behind protective thickets of tall pines. A few moments later, Diana was standing in the middle of the yard, legs hip-width apart and crouched, her arms out as if preparing to be tackled in a football game. Excitement shone on her face, as if she had been waiting to share this with Kayce her whole life. “The first thing you need to learn is landing,” she said, still crouched. “Getting up is the easy part, believe it or not, but landing softly isn’t. Falling is not fun.” Kayce assumed the same stance as her mother, and the two women looked as if they were about to start a wrestling bout. Diana crouched low and jumped high in the air, but peaked no higher than a normal person of her stature. However when she was on her way back down, it was almost as if an invisible force was slowly lowering her to the ground. Kayce jumped experimentally. She landed with ordinary gravitational force. Kayce concentrated and jumped again, this time with force and effort. Same average rise, same average drop. “Philippa imagines jet boosters on her feet like rockets. Anna pictures a hook picking her up. I can’t really explain what makes it work. You just have to get there in your mind.” Kayce scowled at her mom and jumped, trying to imagine her mother’s balloon raising and lowering. Then she imagined jet boosters, hooks swinging her into the air, nothing worked. Her heart rate was starting to pick up with the physical effort and the frustration. This went on for hours, Kayce and her mother hopping in the backyard, Diana periodically demonstrating flight on her own, Kayce’s teenage temper flaring after many, many failed attempts. The two of them were both sweating in the summer heat, their dark ponytails frizzing in the humidity and their stomachs rumbling. Diana was just about to suggest they break for lunch, which should have been several hours ago, when Kayce let out a low, angry scream. “Maybe I can’t fly” Kayce huffed, refusing to meet her mother’s eyes when Diana sat down across from her. Kayce glared at the ground, wishing for some kind of reassurance from her mother but not knowing what she wanted to hear exactly. Up until now, Diana’s mothering tactics have been very positive. Lots of, “You can do it!”s and “Keep trying!”s but Kayce could tell by the silence that her mom didn’t want to lie, and with the exception of Kayce’s inherited super hearing and whatever that was that happened at the hardware store, they had no idea if she had any other capabilities or if she did, what they were. “We don’t really know what you will be capable of. You might not be able to fly. So much of it we’ll just have to wait and see. We already know you have some pretty amazing hearing, and that thing at Home Depot was definitely speed.” Diana said kindly. Kayce picked at the grass and tried not to be disappointed. She was a plain old ordinary teenager this time last week. It shouldn’t be that big of a deal to her that she can’t fly; she just found out that was even a possibility. Diana turned Kayce around and wrapped her arms tightly around Kayce’s ribcage. Her face pressed into the back of Kayce’s sweaty neck, and together the two rose slowly into the air, about six feet up with Diana carrying Kayce. “Mom…” Kayce said nervously, gripping her mother’s hands. Diana tightened her grip reassuringly, and then lowered another foot or so. “No wait… Mom I can’t do this.” Kayce’s heart thudded and she was sure her mom could feel it beneath the grip on her chest. “Just try, Kace. I’m not going to let you get hurt.” And with that, Diana let go. Immediately, Kayce’s back and shoulders warmed, like they had been hit with a direct beam of sunlight. The world was suspended. The hot breeze that was blowing through the trees stopped but all Kayce noticed was the force of what felt like giant wings on her back. Invisible, powerful wings had emerged from her back, right below her rib cage and held her suspended in air. The air did not stir, but the force was there nonetheless; leaving her suspended in midair, inches from her mother’s still arms. Move up, willed Kayce, and the invisible wings propelled her, carrying her belly-first a few feet up and away from Diana. Now down, she thought, and she lowered, but lost control and fell too quickly. Her stomach plummeted and her heart raced and the thought of the strong, sturdy wings was replaced with panic as the world resumed its normal pace and she crashed to the ground. Diana was at her daughter’s side immediately. “I don’t know. Everything just kind of stopped and I was able to clear my mind and concentrate for a minute.” She paused, afraid what she was about to say is going to make her sound crazy. “On wings holding me up.” Kayce stood up and brushed off dried grass and dirt. She subconsciously clenched her fists by her sides and looked determinedly ahead at her mother, who looked back at her with eyes full of doubt and pity. Wings, thought Kayce. I have wings and I can fly. Her feet left the ground and she saw the shock and delight on her mother’s face, but ignored it, her focus not even broken by the rush of adrenaline and fear. Up, Kayce thought, and she slowly lifted a few more feet off the ground. Diana flew up to match her level, one knee lifted, her excited smile showing the slightest hint of worry as she studied the intense look on her daughter’s face. 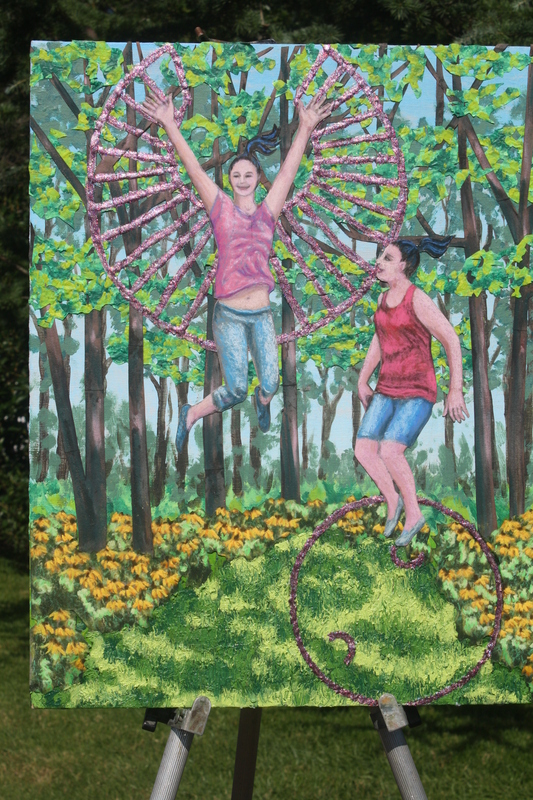 Kayce wanted to tell her mother that she knew what she was doing, but was afraid speaking would break the connection to her wings. Okay, down, Kayce thought, and she started to fall she quickly like before. Slower! She thought, slower, slower… and sure enough, the imaginary wings slowed and she gently touched the ground. Diana touched down next to her. “Well done, Kayce!’ Her mother was beaming. “I am SO proud of you! It took me months to do what you just did!” Unable to help herself, Diana pulled Kayce into a close, tight hug. Sarah wrote it for the intended audience of teenage girls. She worked at Emory University a few years ago in their outreach program for teens. Teenagers need to see how good relationships work so they can have their own good relationships in life. Reading helps teens figure things out when they don’t get enough guidance from adults, or don’t have good role models at home. The mother is like Wonder Woman, from another planet. The girl’s dad is Human. The story’s teenage girl is a human, alien hybrid who is discovering she has some super powers. Sarah told me she didn’t want angel wings on the girl. I agreed, but couldn’t decide how to do the wings. I had it in mind for months, then saw the Latin Ballet and was blown away. They had dresses with yards of pleated fabric attached to sticks which they held in their hands. The fabric was attached to the back of the dresses at the other end. I wished I could examine the dresses more closely. They were so beautiful and graceful as they floated across the stage with their wings. Then I had the idea for the wings, but couldn’t decide how to make them shiny and almost transparent. I considered mylar, but couldn’t find what I wanted. Sarah suggested nail polish and I thought that might work for the wings. I was so happy to find this painting online. 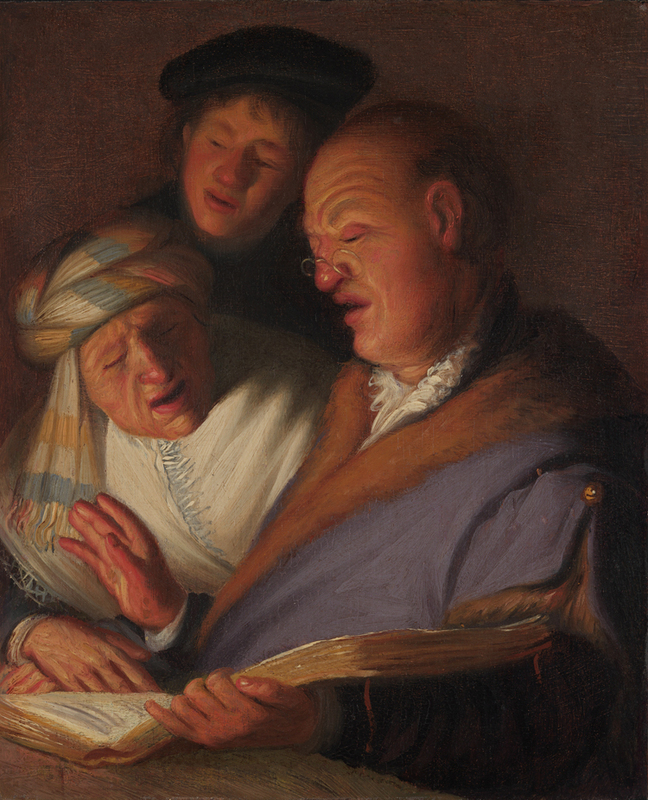 It was in a show at the Getty Center titled ” The Promise of Youth; Rembrandts Senses Rediscovered.” They have a great article with some more paintings Rembrandt did when he was young. The reason I was excited to see it is because I saw it before at the VMFA and tried to sketch it. I was stopped before I finished the sketch by a guard who told me no sketching was allowed. The reason I was told, was because they didn’t have the permission of the owner of the painting. It sounded weird to me because I saw an exhibit of Rembrandts at the High museum a couple years ago that was slam packed with people, and artists were in the crowd trying to sketch. I couldn’t even get close to the ones at the High. At the VMFA, I was alone in the gallery with these small Rembrandts, except for a few visitors. And when they came in, I backed up so as not to hog the Rembrandts. And yet, I was stopped from sketching this in graphite pencil here in Richmond, but there it is online for anyone to lift. I don’t get it.